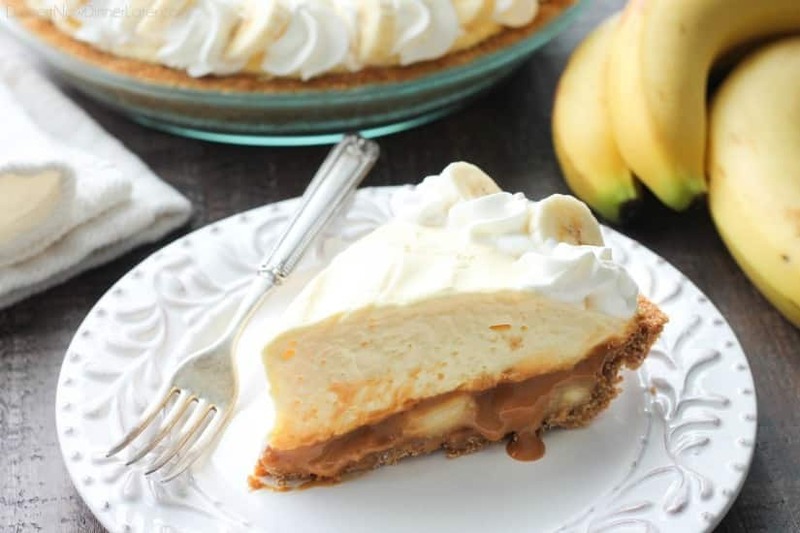 Caramel Banana Cream Pie - Dessert Now, Dinner Later! 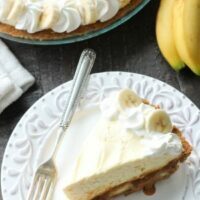 This Caramel Banana Cream Pie is heavenly and so easy to make! 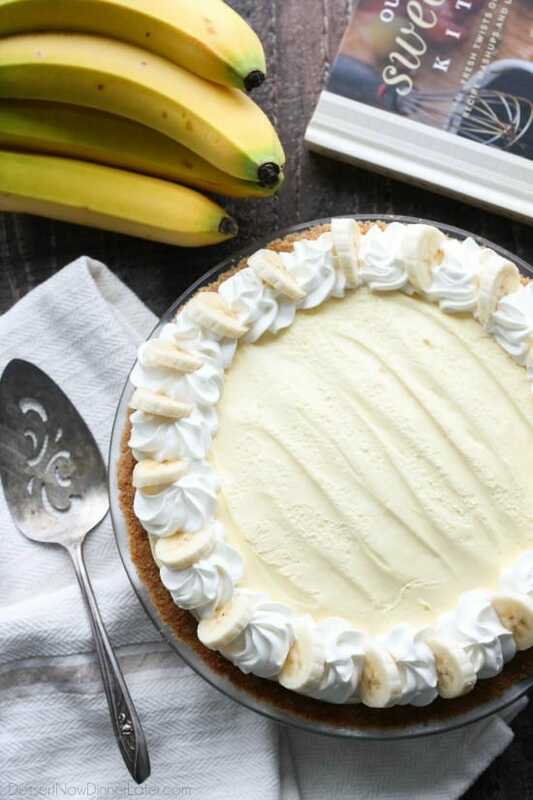 With caramel and freshly sliced bananas on the bottom of a homemade graham cracker crust, and a rich, creamy pudding layer on top, this banana cream pie is sure to be your new favorite dessert! When my friend Carrian asked me to review her (and her husband’s) new cookbook “Our Sweet Basil Kitchen,” I knew it would be a good one! We have similar tastes, and I’ll tell you what! 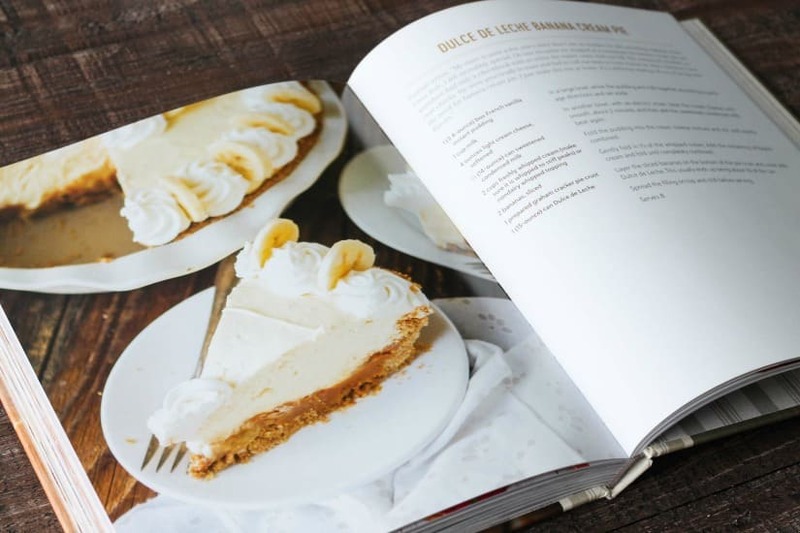 As soon as I opened the book, I found a plethora of tasty looking recipes, but this Caramel Banana Cream Pie won me over! There are so many recipes I want to try from Carrian’s cookbook, and every page has mouthwatering photography and easy-to-read recipes. I got stuck in the breakfast section for a minute, but I knew I had to check out the desserts. That is my true love after all. I was seriously debating on making the Raspberry Lemon Tart Bars, because hello! Raspberries and lemon! 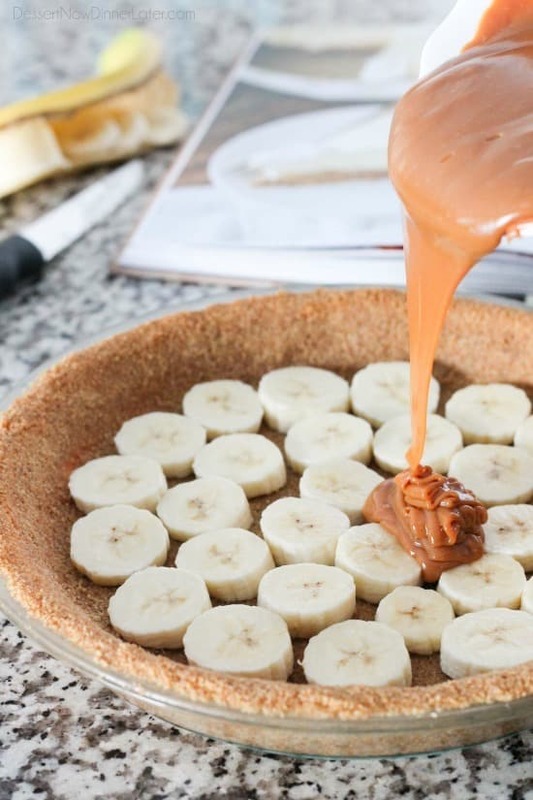 But, I couldn’t stop drooling over this Dulce de Leche (Caramel) Banana Cream Pie. I haven’t made anything like it on my blog before, so I knew I had to try it! Other recipes I am dying to try (pictured above) are Candied Pecan Brussels Sprouts, Steak Burritos with Grilled Zucchini, Sweet Potato Rolls, and Braised Dijon Chicken & Potatoes. But there are seriously, many, MANY more! This book has a hard cover and over 100 recipes to choose from! 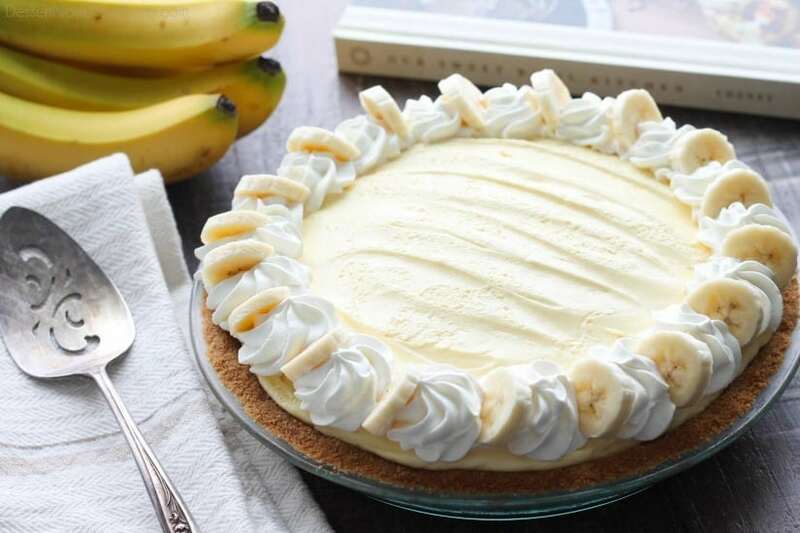 As for this Caramel Banana Cream Pie, you can use a store bought graham cracker crust, but I opted to make my own. (Recipe included below.) The Dulce de Leche (caramel) comes already made in a can, and if you’ve never had it before, it’s basically sweetened condensed milk that’s been cooked to caramelization. It’s super thick and so good! I have a homemade recipe for Crockpot Caramel too if you want to check it out – it’s the same thing! I’ve only recently come around to banana desserts. I used to HATE bananas. I didn’t like eating them plain. 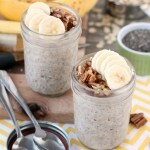 I’d only have them in my smoothie and disguise the taste with lots of other fruits, but I’m a banana in one hand, and peanut butter (on a spoon) in the other hand type of gal now. Haha. 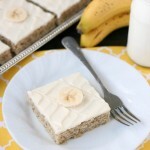 And now that I love bananas, it was only fitting that I start making desserts for my blog with them. 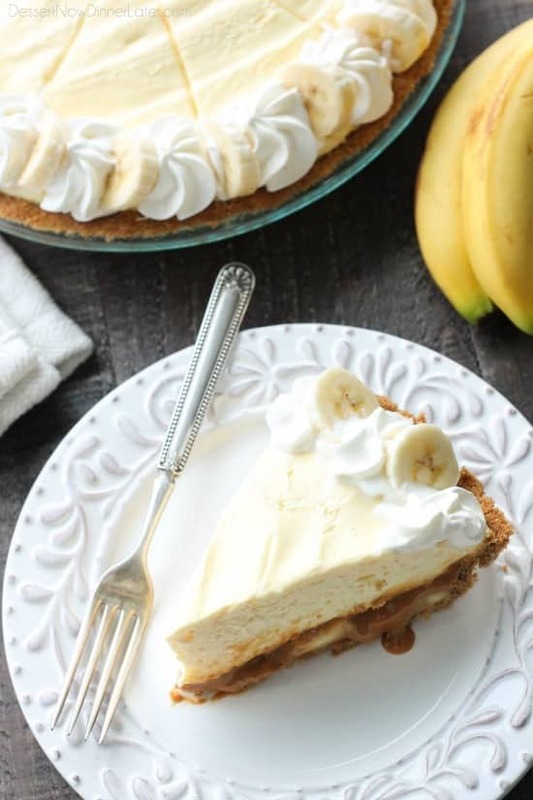 This Caramel Banana Cream Pie is rich, but totally addicting. I’m so glad we shared it with neighbors and friends because if I was left alone with this pie, it would not be good for my waistline, haha! I hope you’re excited to try this pie because I’m excited to share it with you! Be sure to check out the Cheney’s new cookbook Our Sweet Basil Kitchen: Fresh Twists on Family Favorites With Recipe Mashups and Unique Flavor Combinations. You’ll definitely want it in your cookbook collection! For the Crust:Preheat oven to 325 degrees Fahrenheit. Combine the graham cracker crumbs, brown sugar, and salt inside of a 9-inch pie dish. Pour melted butter over the top of the crumb mixture. Mix until crumbs have equally absorbed the butter. Use a drinking glass/measuring cup to press the crumbs onto the bottom of the dish, and your fingers to press the crust to the sides. Bake crust at 325 degrees Fahrenheit for 10 minutes. Crust will be lightly golden brown. Cool completely. For the Filling:In a large bowl, whisk the pudding and milk together for 2 minutes. Set aside. In another bowl, with an electric mixer, beat the cream cheese until smooth. Add the sweetened condensed milk; beat again. Beat in the pudding until evenly combined. Fold in ½ of the whipped cream. Add the remaining half of whipped cream and fold until combined. Spread the cream filling on top and chill before serving. (I cover mine with plastic wrap.) 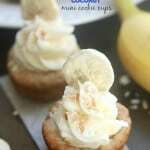 Add extra sweetened whipped cream and sliced bananas on top for decoration just before serving. Store in the refrigerator up to 5 days. *Recipe altered from Our Sweet Basil Kitchen Cookbook and Crazy For Crust. 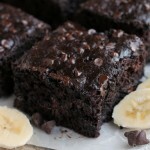 I have literally been checking your website every day for this recipe since we got that little taste, and I made this TO-DAY because I just couldn’t wait any longer!! Thank you so much for sharing! I ended up using caramel ice cream topping since I didn’t have any dulce de leche (or time to make any), and it was still delicious though a little more soupy. Next time I will definitely plan better and have some dulce de leche on hand. Thanks again! Oh my gosh Michelle! You made my day! I didn’t realize you were wanting to make it ASAP or I would have just written it down for you. Haha. I’m so glad you liked it! It’s my friend Carrian’s recipe. This is a fail, the Dulce de Leche will not set properly, it stays to soft. What do you do freeze it before adding the top layer? The dulce de leche should be pretty thick straight from the can. If it was microwaved too long, then yes, I would try freezing it before adding the top layer. If you have a delicate hand, you can possibly just dollop the top layer and gently smooth it over. It has to chill/set in the refrigerator anyway.